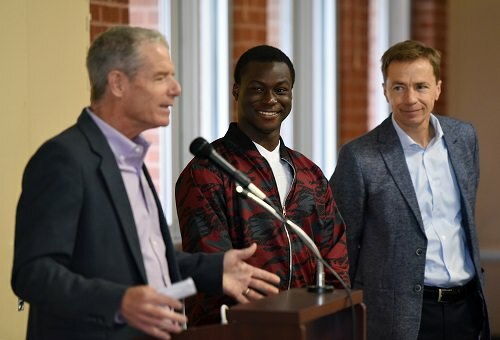 The C of I is welcoming its largest international class in its history this semester, including three students from Nepal who had previously been set to attend school in Texas. We're happy to have them, as well as the rest of our 120 international students representing nearly 70 different countries! Check out this great feature here by KIVI Channel 6 about the Nepalese students! 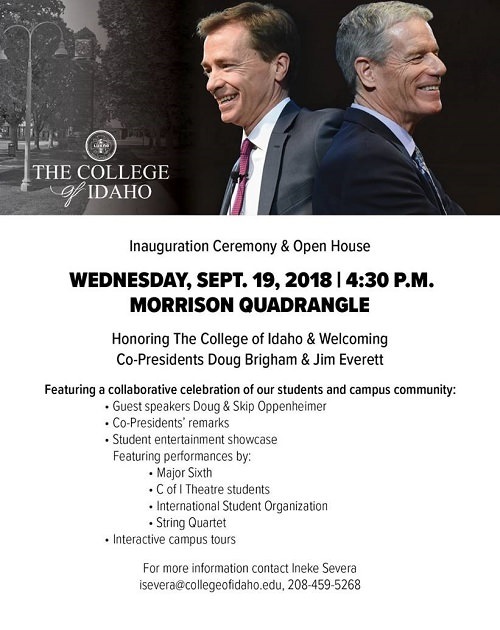 We are pleased to invite the community to the official inauguration ceremony and open house event for our co-presidents Doug Brigham and Jim Everett, to be held at 4:30 p.m. on Wednesday, Sept. 19 in the Morrison Quadrangle of the C of I campus. For more information, contact Ineke Severa at [email protected] or (208) 459-5268. The College of Idaho hosted the 6th Annual Caldwell Youth Forum on Sept. 12! We were pleased to welcome 75 of the brightest high school students in Canyon County for a full day of leadership exploration and teambuilding – check out what some of the forum’s organizers had to say to the students here! The final days of summer are coming to a close, but The College of Idaho’s Whittenberger Planetarium will ring in the start of the fall season with a public show recognizing the 2018 Autumnal Equinox at 7 p.m. on Friday, Sept. 21. Tickets for the show cost $6 for adults and $3 for children between the ages of 4-17. 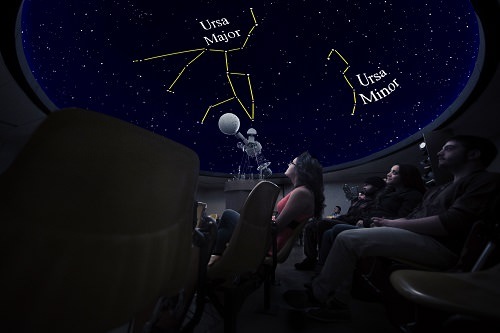 Visitors should arrive at least ten minutes prior to the show’s beginning due to limited seating and should purchase tickets in advance at https://www.collegeofidaho.edu/about/campus-facilities/planetarium. How do material objects come to have meaning? Our Gipson Honors First Year Seminar class recently made a film to document the answers! Check it out here, and subscribe to our Youtube channel here! 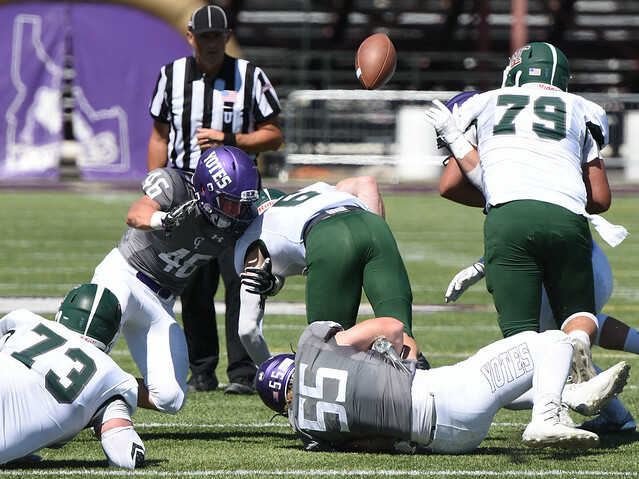 Coyote Athletics Roundup: C of I football has faced close losses to start off the season, including a loss in the home opener versus Montana Tech and on the road against Southern Oregon. They face their next road opponent Portland State on Saturday, Sept. 15. Junior linebacker Forrest Rivers was recently profiled by the Idaho Press – check out the full story here!…The C of I men’s basketball team added another exhibition game for its 2018-2019 season, setting a matchup against the University of Montana on Dec. 3, the first time the teams have met since 1981. For the complete basketball schedule, click here. To learn more about the recently announced 6th-Man Club, which allows members hands-on access to the team, click here…The Lady Yotes volleyball team fell in a close bout with Southern Oregon, but swept their sets against Warner Pacific and Multnomah to extend their season record to 8-4 (3-1 CCC). C of I cross-country runners swept the Cascade Collegiate Conference Cross Country Runner of the Week honors, with juniors Marcos Cervantes and Molly Vitale-Sullivan honored for their efforts at the College of Southern Idaho Classic. Vitale-Sullivan earned her second career meet victory with a win in the 5,000 meters and helped the Lady Yotes to 3rd place overall, while Cervantes placed 7th overall in the pack, leading the men’s squad to a 2nd place finish overall….Men’s soccer opened its season with a draw against Jamestown, but secured its first win of the season against the South Dakota School of Mines. The women’s team finished their preseason unbeaten with a 3-0-1 record, including a victory against Whitman College. Freshman Shae Waters earned Women’s Soccer Defensive Player of the Week honors…Men’s golf posted a Top-10 finish at the Northwest Christian Invitational. Natalie Mullins led the women’s golf squad with a third-place finish at the same event, although the team did not record a team score as they did not have four players to field. Faculty and Staff News: English professor Scott Knickerbocker’s band the Hokum Hi-Flyers will play for a square dance at the Indian Creek Festival in the new Indian Creek Plaza in downtown Caldwell on Saturday, Sept. 15 from 6-8 p.m. No dancing experience is necessary! Click here for event details…We’ve had a number of transitions in the Foundations and Corporate Relations Office. Dr. Regina Maldve has been hired as the new Director of Foundations and Corporate Relations, starting in her new position on Sept. 10. Sarah Nash, former director of the C of I Boone Fund, has been named to the Associate Director Position. Lauren Schilli, previously the Annual Fund Coordinator, has been named the new director of the Boone Fund. Alumni News and Notes: Bob Beckwith ’72 and the rest of the C of I alumni of “Team Science” successfully completed their “Source to the Sea” trip – rafting over 900 miles on the Salmon River to track water quality and eDNA. Check out their full story here!...Dr. 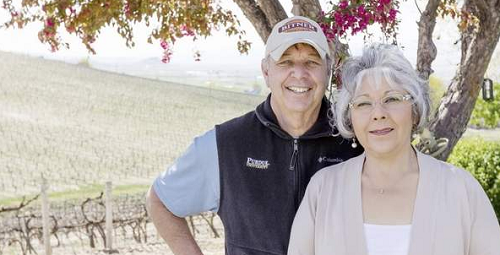 Ron Bitner ’68 was featured by the Capital Press for his vineyard, Bitner Vineyards, discussing how his passion for bees would later lead to his passion for winemaking. Check out the full story here!...Caitlin Copple Masingill ‘04 has been named a finalist for the Boise Young Professional’s Young Citizen of the Year. The winner of the award will be announced at the BYP’s 12th Annual Gala at 6 p.m. on Sept. 20 at Northwest Nazarene University…Jacob Karn ’16 has joined the faculty at the University of Colorado at Colorado Springs as an instructor at the mathematics department.